Jill Wolf, Learning Specialist, helps homeschool moms overcome curriculum disappointment, planning fatigue and a shriveled creativity by developing meaningful experiences to Awaken the L.E.A.R.N in Learning. Her visual brand is hopeful, creative, and accessible to children and moms of any age. Fran Ritchey is a virtual-assistant-turned-life-coach whose mindful and organized support helps her high-level clients find success with ease. Her visual brand evokes a luxurious, personal, and tranquil feeling that reflects the life her clients are aspiring to. 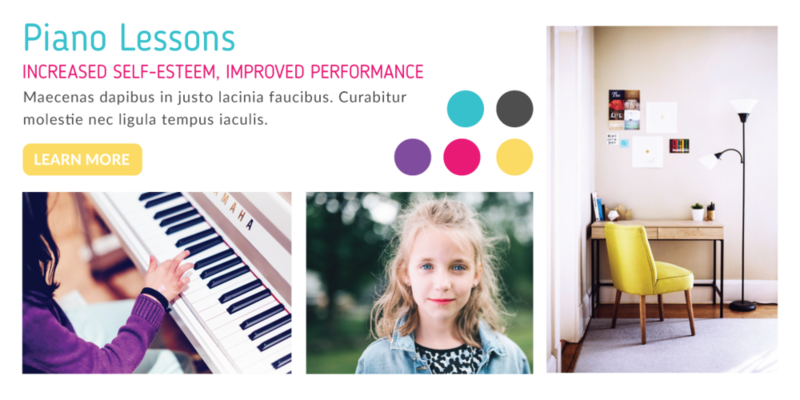 Sounds Like Me provides piano and singing lessons to children in Houston, TX that encourage creativity and emotional resiliency. The Sounds Like Me visual brand is fun and creative, but also peaceful and safe. TheCSCatUNM is located on the east side of the University of New Mexico campus and is a place college agers can call a second home and find a group of people who enjoy sharing life together while studying and experiencing the word of God. The visual brand takes the UNM colors and transforms them into a young, warm and friendly visual brand, representing the very spirit of the organization.